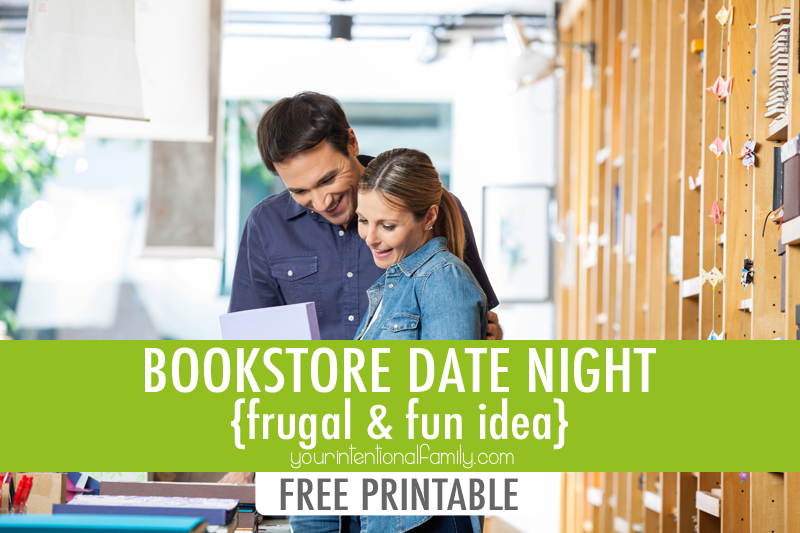 Do you need a fun and frugal date night idea? We have just the one for you! We don’t enjoy a lot of date nights out of the house right now (something about the wee people living under the same roof with us), but when we do get out, you can bet that we will probably find our way to a bookstore or library. 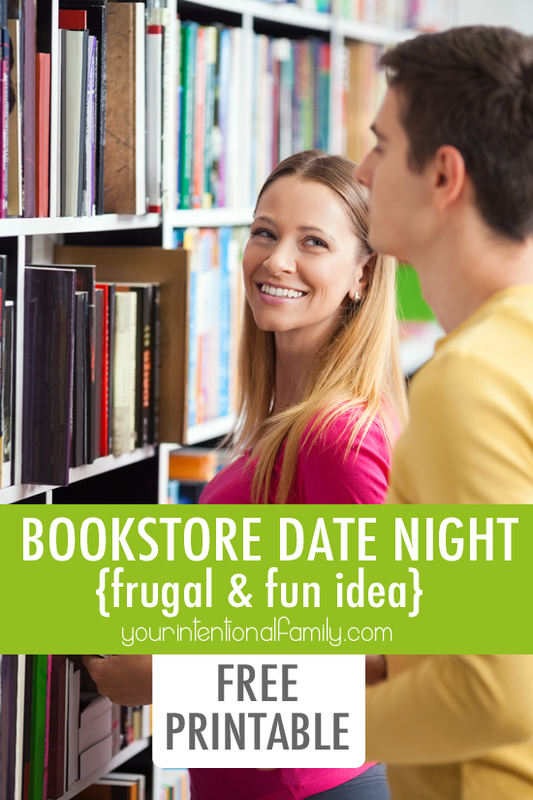 I’m not entirely sure why, but hitting the bookstore or library is our absolute favorite date night idea. It’s frugal, which is definitely something we need right now. It’s fun, which is definitely something everyone wants in a date night. And it’s different each and every time we venture out together, which is the fun of date nights – getting out of routine and ordinary, right? So, if you’re looking for a fun date night out idea, please give this one a try! 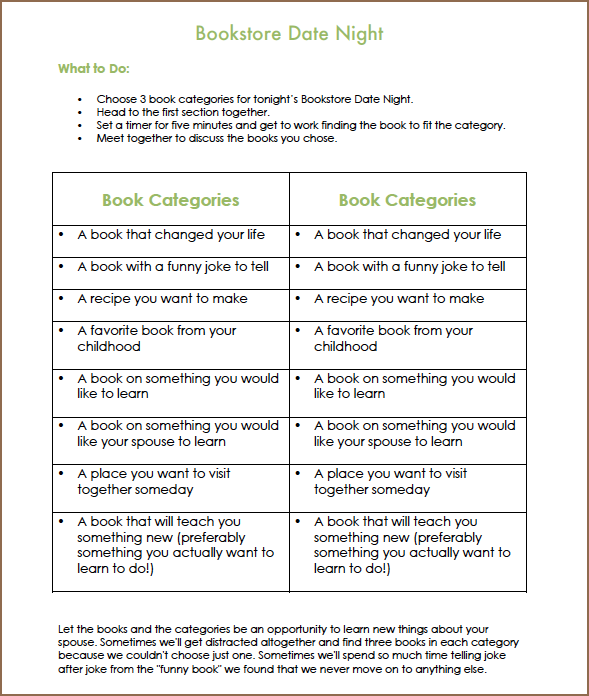 Even if you ‘re not a book lover like we are, we’re willing to bet that you’ll still enjoy this date night idea immensely! Plus don’t miss the free printable at the end of the post to take with you. First, you’ll need to pick whether you want to go to a bookstore or library. We’ve done both and enjoyed both equally as much as the other. The bookstore will be a bit more noisy and lively, especially if you go to one like Barnes & Noble which is where we go. Plus it has coffee and cookies and fun reading nooks and crannies. There is also a nice diversity of books to sift through for each category (more on that in in a minute). The library will be much quieter. We usually choose this option when we are “peopled” out (I’m an introvert and my husband is on the introvert end of the extrovert scale), or when the wee people in our house have harried us to death that week. The quiet of the library is just what we need to soothe the senses and really get comfy with one another. Since moving to our new town though we don’t choose the library nearly as often because there’s no snack bar or coffee like there was in our previous town. We like to have coffee or tea when enjoying this date night idea. But it’s not mandatory to a thoroughly enjoyable time together. So, choose where you’re going – the bookstore or library? You want to make a plan for what books you’re going to find together. There are so many different ways to do this, but I’ll tell you how we’ve settled on doing it. We look through the list of ideas on our card and decide on three books we’ll find from the list. Don’t even try to do all the categories. We have only ever managed three categories on a good night. You’ll find yourself talking and laughing and discussing each category for longer than you ever imagined possible. We’re always so surprised by how much time has passed between categories! The point is to agree on the book categories so you can compare and contrast the books you each choose. Once we’ve decided on the three different types of books we’ll find, we head to the first section together. We set a timer for five minutes and get to work finding the book to fit the category. Note: You’re each finding a separate book. You’re also trying not to watch what the other person is looking at so you can be totally surprised and not be swayed by your partner’s choice. When the time is up, meet together to discuss the books you chose. Read the book together – most of the time the book is short enough to do this! Read a portion that you remember being so memorable if the book is too long to read-aloud completely. Talk about why you remember this book. Try to remember the first time this book was read to you and tell about the experience. Share from your memories and let the conversation go wherever it may lead! Then, let your spouse tell you about his or her favorite children’s book. Continue doing this for each section. 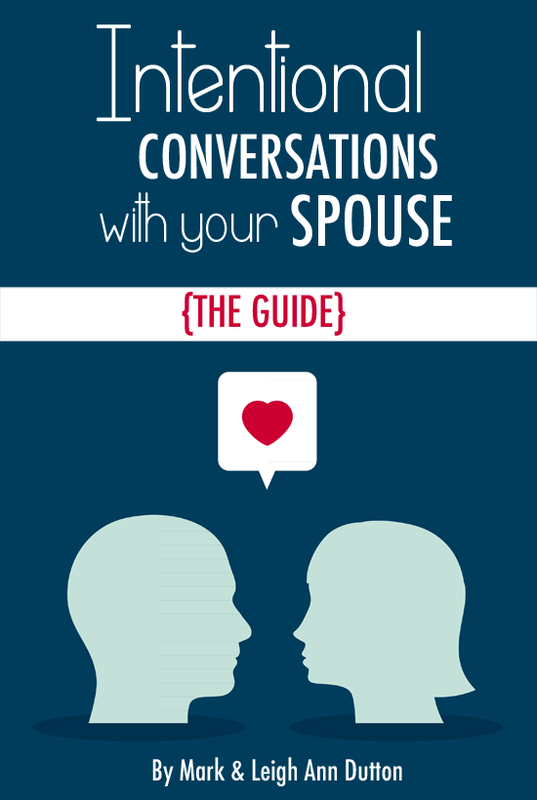 Let the books and the categories be an opportunity to learn new things about your spouse. Sometimes we’ll get distracted altogether and find three books in each category because we couldn’t choose just one. Sometimes we’ll spend so much time telling joke after joke from the “funny book” we found that we never move on to anything else. It’s fun to just chat about memories around certain books and categories, or even to dream a little bit as you look at pictures of where you want to go together someday. This is hands down our favorite date night idea ever. We have a hard time trying anything new because we enjoy this one so much. Give it a try and be sure to tell us what you think! 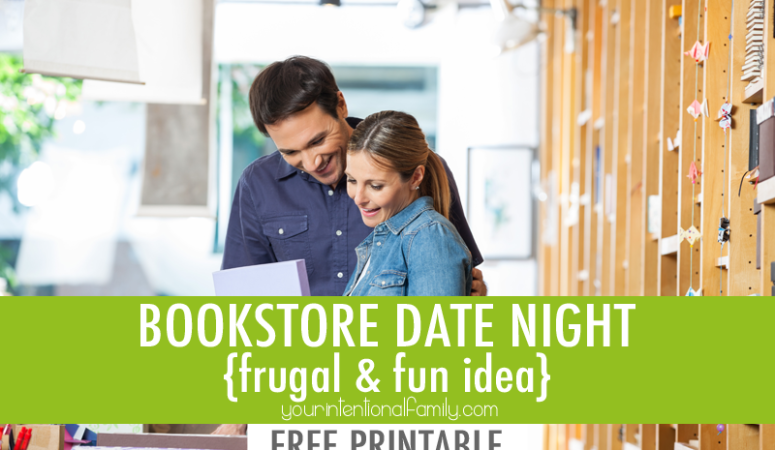 Don’t forget to download your FREE Bookstore Date Night Idea Printable! Enter your email address below, and we’ll send you a FREE printable to use on date night. You’ll also be added to our weekly email newsletter that will continue to encourage and equip you to be intentional in not only your marriage, but your entire family’s lives. Don’t worry – you can unsubscribe at any time! 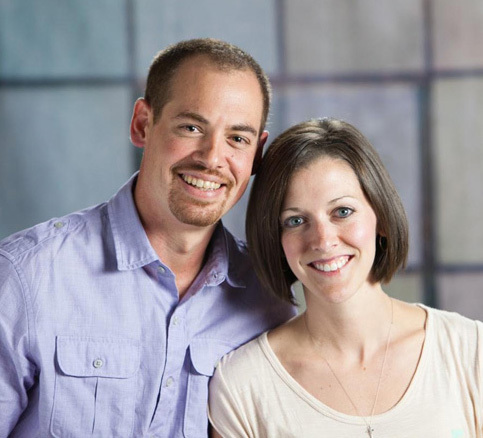 Check out these 42 Date Night Ideas for the Date Night Challenged!